Printing, embroidery, micro-brewery - story of a multi-faceted businessman. Panama's Mountain town of Volcan has seen many changes in the last ten years- I predict that the next five years will see even greater changes. A new city center- a new four lane highway from Concepcion and a new and vibrant entrepreneurial spirit in the business community. I don't think anybody embodies that new spirit more than Volcan's renaissance man-Ovidio Portugal. Born in Panama City 42 years ago, Ovidio is doing a university course to become a health & safety lawyer. 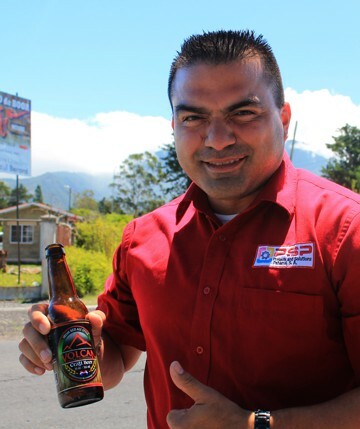 As part of his field experience on health & safety issues he visited the National Brewery where Panama's oldest beer; Balboa is brewed. This was an epiphany for him. With steam pouring out of tall stainless steel brew vats and copper kettles, Ovidio's dark brown eyes must have swelled wide open. The work environment spoke to his career mind but his heart spoke to him even stronger "Ovidio' it said, "We are going to make our own beer." 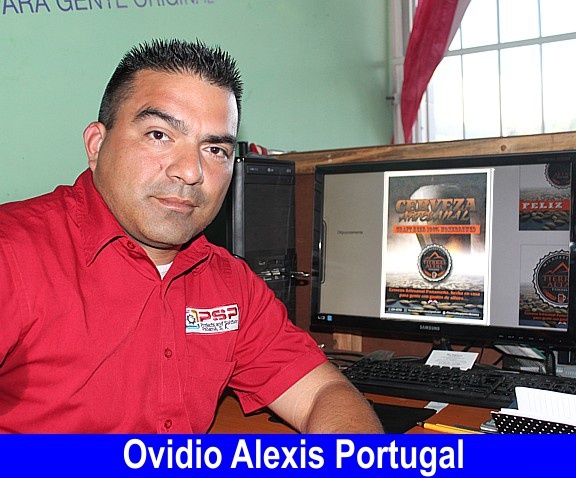 Ovidio's wife, Anna Maria, is from Volcan and to no one's surprise the eternal spring climate of this mountain town is where they set up their printing and embroidery business; PSP Solutions. His printing and graphic business feeds his family but his small micro brewery feeds his soul. I asked him why on earth he would want to start making artisan style beers. Ovidio is obviously highly creative and extremely passionate about everything he does. He told me that he wanted to make something different from the bland commercial products currently available. As his hands caressed the air with an imaginary bottle he said,"You must make beer with Love" he said, . "The ingredients are simple; it's just hops, yeast, malt and water but the first 24 hours after adding the yeast are critical. And you have to wait 6 weeks before you can taste it - only then will you discover if you have done things right." Ovidio does use other ingredients that are, to be honest, radical. For example who in their right mind would ever dream of adding chocolate to a beer? Ovidio has - and to be honest it seems to work. He has also added orange peel, passion fruit and berries and beets. The last ingredient; beets are in his Puro Sangre beer. 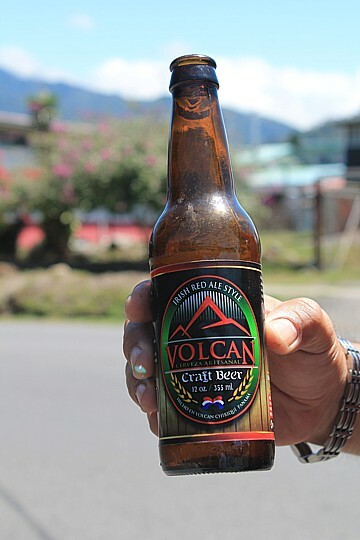 He is currently working on restructuring his micro brewery at his home in Volcan. There are several outlets locally that carry his artisanal beers. It does retail at the slightly higher cost of $4:00 a bottle, but if you compare this to the imported specialty beers this is not too far off the mark. Finally, I decided in all the best traditions of journalism to experience the product rather than to waffle on about it. I took my dear lady wife, Lydia, to the DEEP FOREST TAVERN, in Paso Ancho and invited some friends to sample two of the beers. About half a dozen guests at the DEEP FOREST were invited to sample a small amount of the two beers on hand. 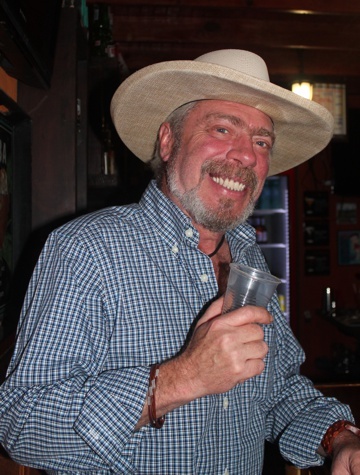 Local musician Larry Denne was one of the test samplers. I think the smile on his face speaks volumes. The most popular was the MACHO DE MONTE beer. This always came out with a thick head, regardless of how carefully you poured it. The consensus was that it tasted more like a Porter (a sweeter dark beer). A British Guinness expert was on hand and Steve Langan, agreed the Macho tasted like a porter. The PURO SANGRE beer was not as popular. Possibly peoples taste buds have not evolved to the level where fruit is acceptable as a beer ingredient. 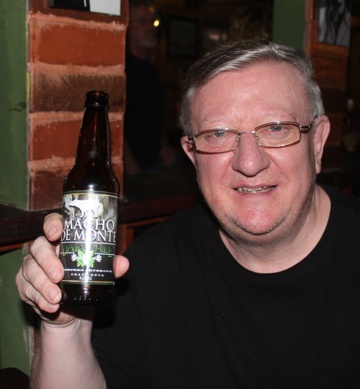 Ovidio seems to be on the right track with his Macho De Monte beer - Guinness drinkers all seemed to like it. The price did cause some concern but if Ovidio can produce larger batches and reduce the price somewhat then I see a distinct future for Volcan's fledgling micro- Brewery. One thing is certain; people are getting fed up with the same old drinks on offer, so Senor Portugal may be on to a winner with his unique brand of highland beers. Steve Langan from Birmingham, England - self proclaimed Beer expert. Stay tuned as we hope to have a larger beer tasting soon at the DEEP FOREST TAVERN. Ovidio Portugal says he can produce a keg of his finest beer so some serious and in-depth tasting can then take place.